Grab That Greasy Joystick, Joe—It’s Arcade Time! Boxed up FUN— The games still in their original packaging. (Photo: Mark Otnes) Click to enlarge. 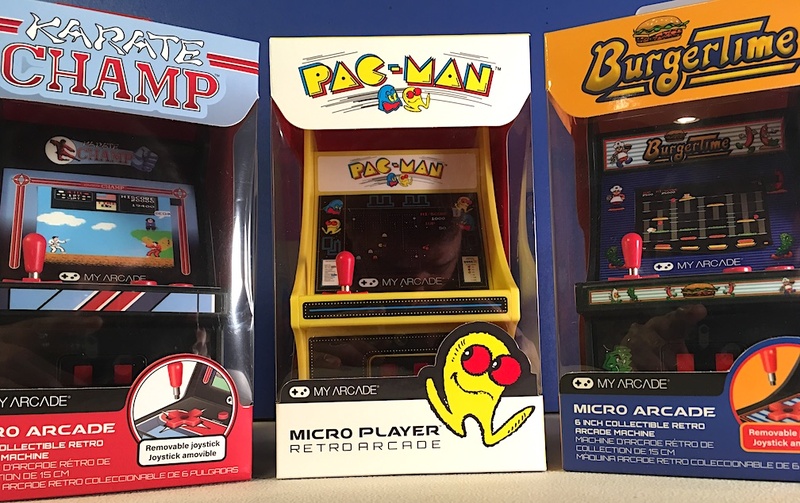 We LOVE miniature 1:6 scale video games. Fortunately for this holiday season, a batch of approximately 10 new ones are now appearing in stores across the U.S., primarily from the good folks at My Arcade. These new games are currently priced between $25 and $35 (each) depending on where and WHEN you buy them. Our advice? Watch your local big box stores like a hawk. Also, browse online at Walmart.com, Amazon, etc. Whenever you see a game’s price dropping, JUMP on it! These are popular little items with a wide variety of collectors and ordinary consumers, so they typically don’t last on shelves for long—virtual or otherwise. Battery Hogs?— These new games really need the juice, four AA batteries to be precise. Ouch! 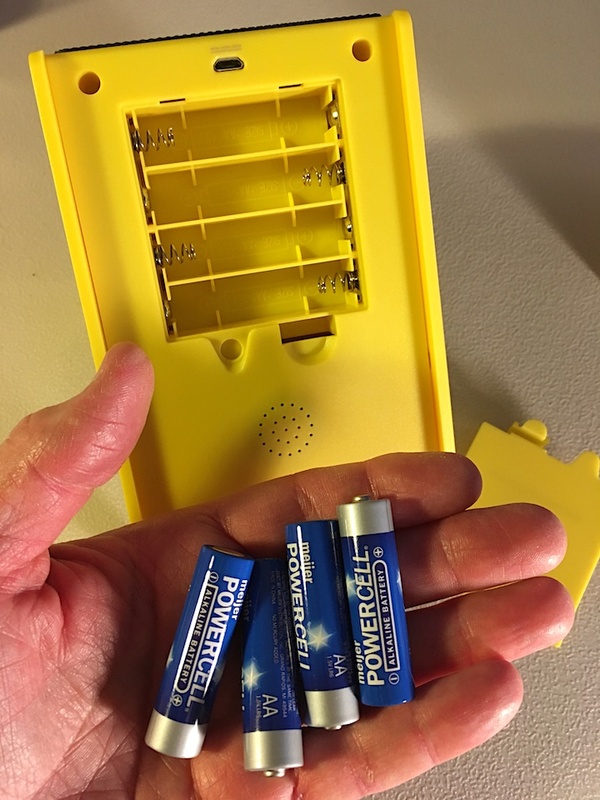 Remember to always REMOVE batteries when not in use! (Photo: Mark Otnes) Click to enlarge. 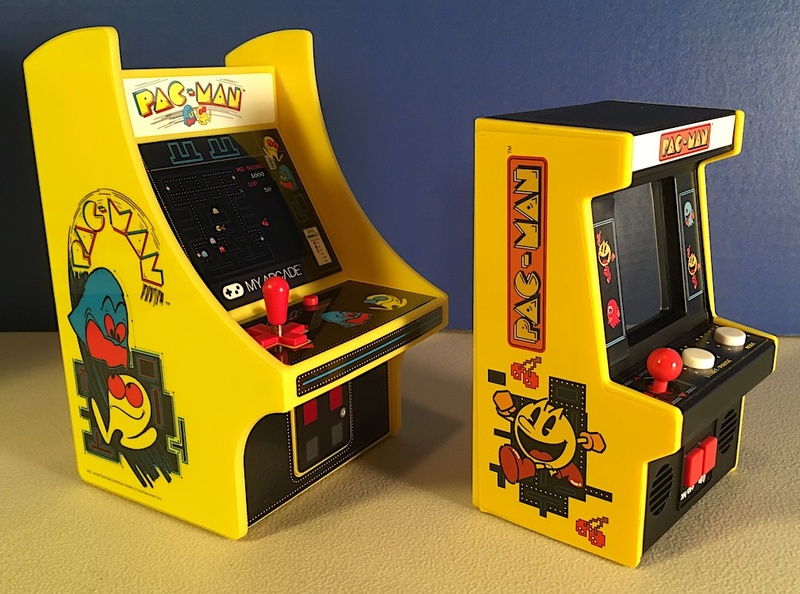 Better Designed— Last year’s smaller, simpler, “one size fits all” cases from Basic Fun (shown on the right) don’t compare with this year’s bigger, better, more accurate case designs from My Arcade (shown on the left). Even the buttons and joystick sizes are more accurately scaled to fit 1:6 scale. EXCELLENT! Regardless, both games will still ROCK in GIJOE’s arcade! (Photo: Mark Otnes) Click to enlarge. 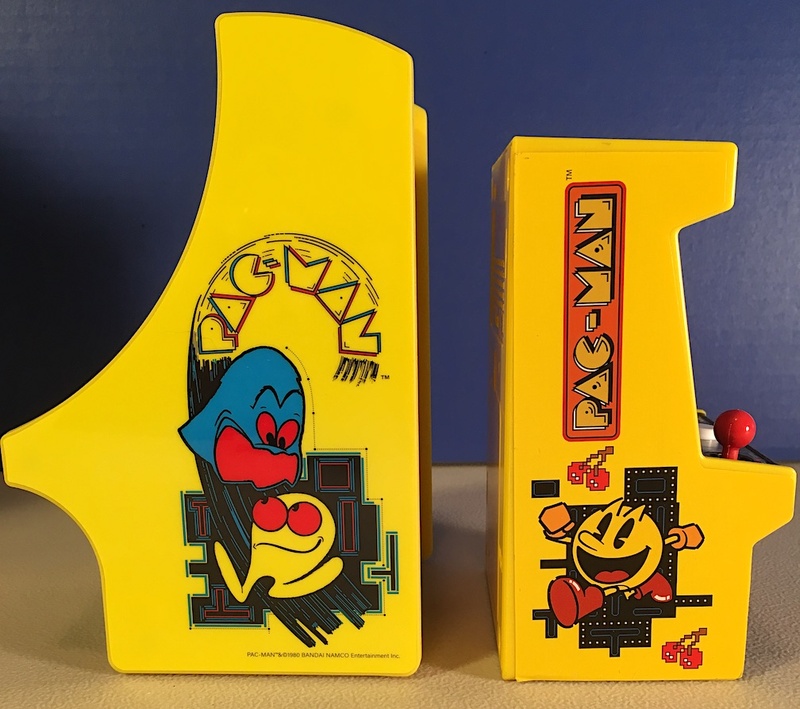 A Back to Back, “Pac to Pac” Comparison— The new Pac Man game case from My Arcade (as shown on the left) is clearly more stylish and faithful to the original game’s design. The smaller, (boxier) case from Basic Fun (on the right) was good—but it wasn’t great. (Photo: Mark Otnes) Click to enlarge. 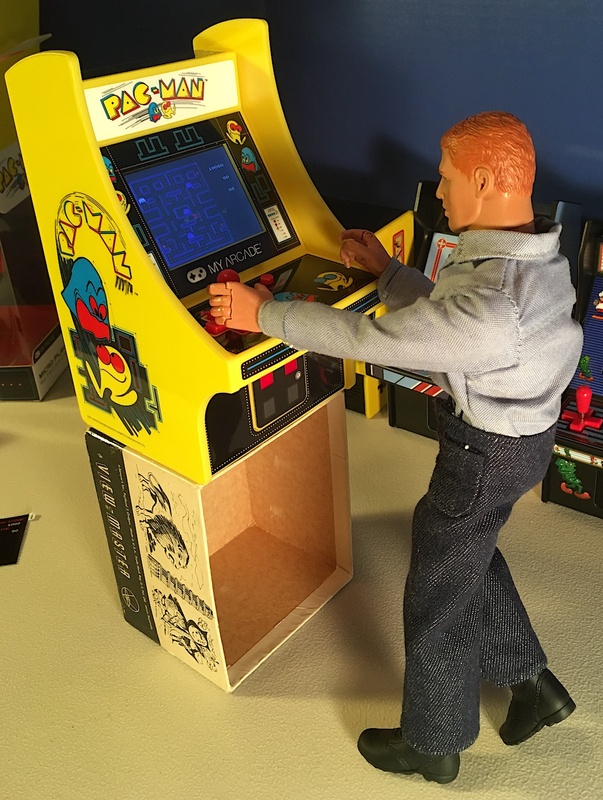 Raise ’em up so Joe can PLAY— To save money, the makers of these miniature arcade games chop off the bottom halves of the cases where in the real-world, all of the game’s computer “innards” were stored. To make up the resulting height deficit, we recommend that you create some sort of a base to raise the games back up to Joe’s level (see our previous article HERE). (Photo: Mark Otnes) Click to enlarge. Bottom Line: We’re hoping someone comes out with a miniature version of the original “Pong,” “Robotron,” or maybe even “Zaxxon.” Those were three truly iconic arcade games from back in the late ’70s and early ’80s. Remember, watch those stores and look out for sales. Happy Hunting!